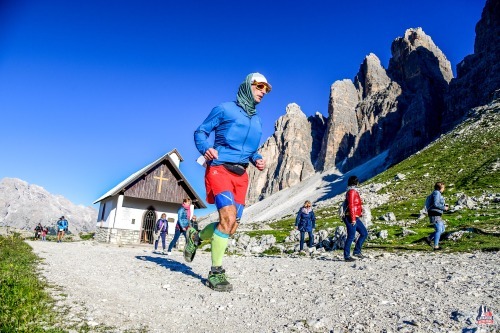 No medal, no finishers photo but I did complete the Lavaredo Ultra Trail. No really I did… I have my coveted bin bag to prove it! Too bloody cold to dress down for the money shot! Apologies for the sarcasm! 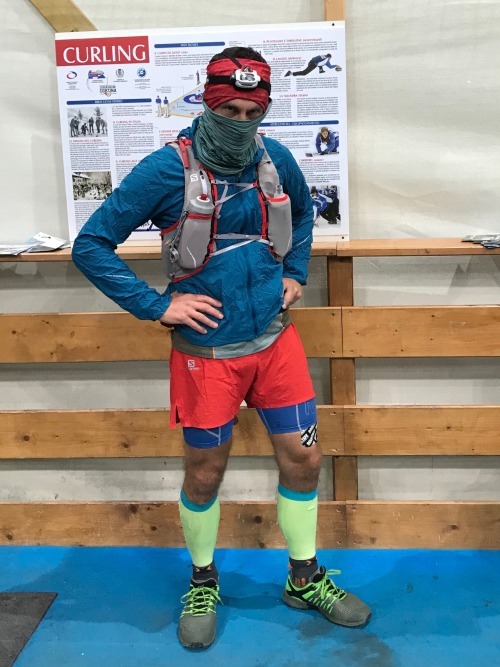 As much as I would like to beguile you with glorification of yet another epic ultra race on the global circuit I just wasn’t feeling it at LUT. I did approach the proposition with a certain apathy not expecting to make it beyond the ballot. Ironically, Wayne had been instigator and he was left wanting. Becky was on cloud nine - finally she would run her dream race. Dave and I were just left contemplating what we had signed up for. 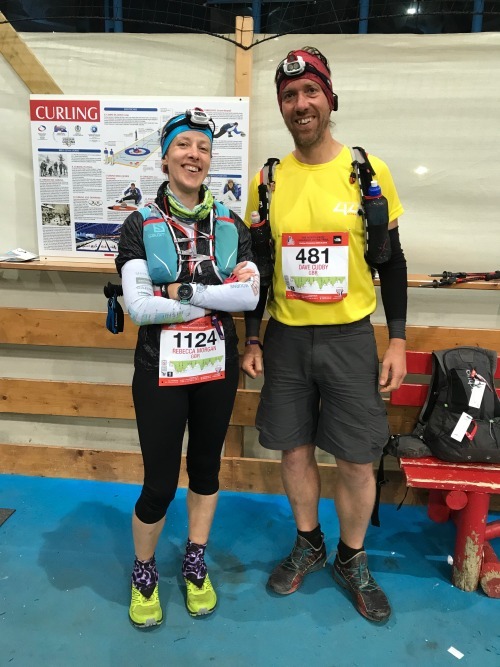 Training, of the high mileage variety, never really started in earnest but I did race the Camins de Cabres, an extreme Spanish night marathon, three weeks prior where I managed to slice open my hand and smash up my kneecaps for the umpteenth time of the year. Give me technical, give me vertiginous ridge lines, give me scrambling. I was ready. Wrong race fool! 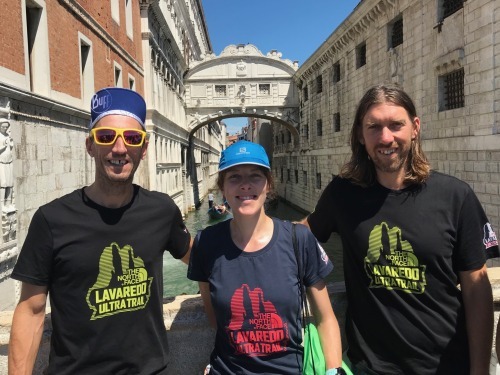 Described, by some, as UTMB’s little sister, Lavaredo Ultra Trail is Italy’s offering on the Ultra Trail World Tour and accredited as one of the pinnacle five races that make up the Series. Perhaps had I taken heed of this I would have been a little more prepared for the thousands of athletes and all that comes with them. Looks kinda hilly but most of these climbs are pretty long and gradual averaging 10% gradient. Apparently the real race starts at Malga Ra Stua. Certainly from there on in the course was a lot more fun. Photography comes at a premium - an extra 30 euros. With cameramen dispersed across the ranges, and some exuberant post production, possibly worth budgeting for if your social media gravatar needs an update. Even an official LUT BUFF comes at an extra 15 euros! Hoodies, a requisite purchase at every big race I have done, were non-existent. Sold out, or pre-order only, I guess? Probably should have read all the newsletters that trickled through pre-race. 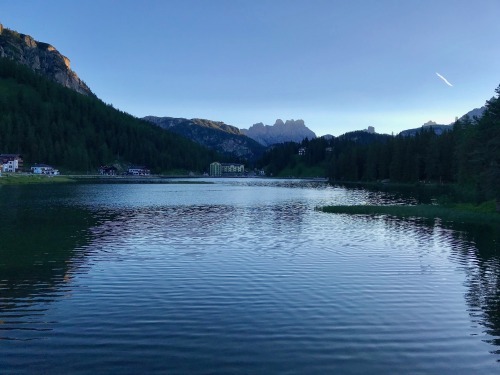 Small bonus was a £62.75 return flight from Gatwick to Venice and twelve euro return bus journey to Cortina d’Ampezzo. Unfortunately that was about the only things that came cheap and the rest of the trip would burn colossal holes in the pockets. As far as registration goes I would recommend arriving early since the queues are very long. Also, take a doggy bag to fill up on cake, breadsticks and other local delights from the many race promoters in the Expo which you are obliged to march past after collecting your bib. After all you are unlikely to find your usual pre-race snack in the Cortina kwik-e-mart. Getting better at kit organisation. Still left Dave and Becky waiting indefinitely in the campsite café as I made a few last minute alterations. 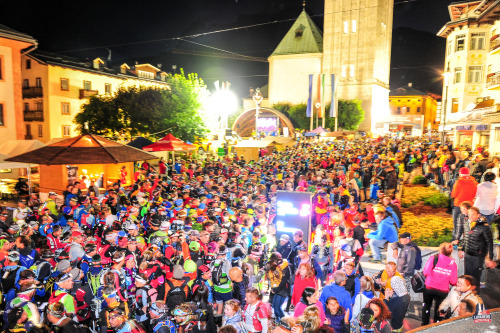 The euphoric atmosphere and glowing starlets radiating from iPhones and GoPros on the start line had me questioning whether many of the competitors had mistakenly turned up for an Ennio Morricone concert. The smell of tiger balm, mostly emanating from a muscle strain in my back, was reminder of our real purpose. The Ecstasy of Gold rattled from the loud speaker. 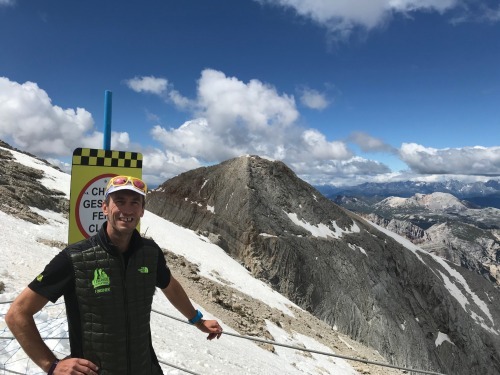 No doubt Haydn Hawkes would be feeling that in just over twelve hours as he went on to smash the course record in near perfect running conditions. Did I mention we were this close (holds arms at length) to that perfect Haydn moment on our first night as Mr Hawkes came waltzing out of Pizzeria Restorante as we gazed blearily into our first five euro German beer. No-one else appeared to recognise the trade-mark moustache! Opportunity missed. I didn’t take this photo but I might be in it somewhere! Anyway… when the music stops, the countdown begins. Uno. Then we wait patiently for a few minutes to cross the start line with the other 1608 runners and begin the parade through town. This bit is fun and like nothing I have experienced - MIUT being my largest race to date with less than half this field. For a mile the streets are lined with spectators cheering, snapping photos and high five-ing runners. Eventually the crowds give way to runners standing and squatting at the side of the road to finally relieve themselves of too much hydration after the sixty minute wait in the starters pen. Well for those who weren’t prepared to scrape soggy seconds of carta igienica from the floor of the solitary toilet cubicle in the mess hall. So. 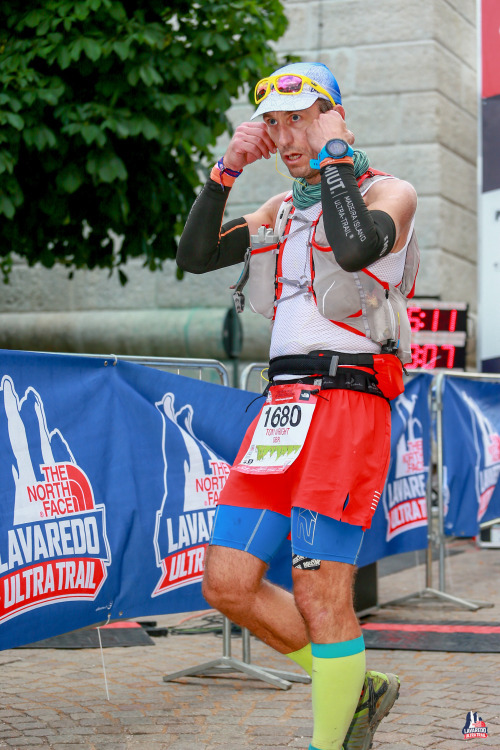 What did I learn on the Laverado Ultra Trail? 1. Camping at 24 hour races is ill-advised! The logistics of getting tent poles and pegs through two connecting flights meant a shared 21 kilo trunk on wheels. Wheels that didn’t take too kindly to 2km of dirt track to our base at Camping Rocchetta. Complementary haulage is no way to spend race morning. Sleeping in a tent in 20 degree sun is no way to spend race afternoon. Dave and I resorted to champagne table tennis and crazy golf. While Becky, having chosen us the solitary sunny pitch on the entire site, retired to the shade. Probably to recite a plan of action which would see her tear through the field and leave Dave and I unequivocally chicked. Come race evening I was ready for bed. I would have to rely on some fine Italian coffee at the checkpoints to get me through this night. Wrong! The only caffeine on offer throughout the course appeared to be Coke. Really!? 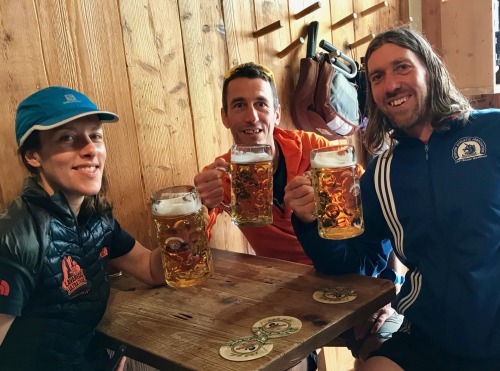 Perhaps I should have scrutinised the regulations which read: ‘it will also be possible to make use of the mountain shelters along the route where athletes can purchase food and drink (at their own expense)’. Go buy your own hot beverage at a refuge, sucker! What have you done with Tango Tom? Tired means cold and I wore everything I had ahead of the start. Of course once I was out of town most of it came off again and spent the rest of the night in my pack. Who is your money on out of these two? A sharp eye might be able to make out the spiritual nature of Barefoot Dave’s borrowed shoes. 2. Big race = a lot of crowds and a lot of queues! This is no way to escape the bustle of modern life. 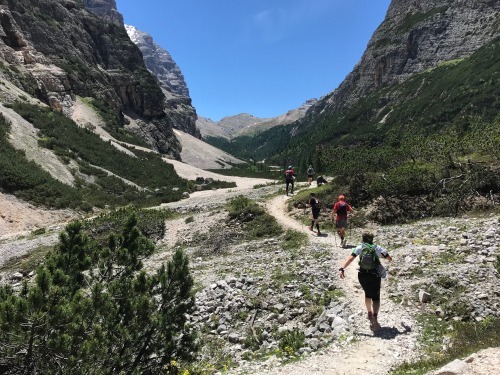 Within ten minutes of leaving Cortina’s streets we were bottlenecked by a gate at the start of the first woodland path and the first ruck of the night ensued. The next four hours were a stroll. Fine on the uphills, frustrating when you intend on making up time on the descents. No sooner did gravity compel the group to accelerate then pace was disrupted by another tight switchback that bought our train to a grinding halt. 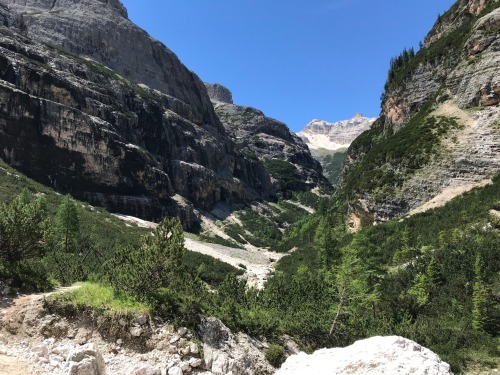 Of course, the narrow paths and densely vegetated steep banks did little to deter the odd enthusiast from barging past hollering some typically gruff italiano. I intentionally chose to start slow and was unaware of how far back in the field I was. 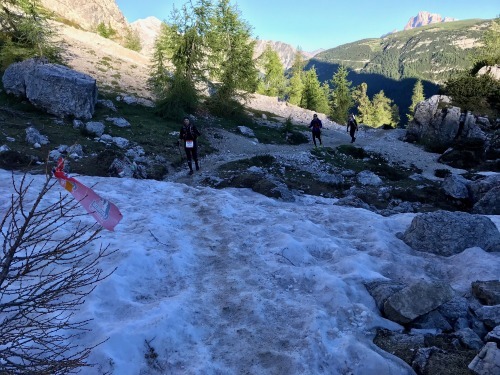 I have only myself to blame - more walking race than running race - and that is what you get for failing to appreciate the impact dumping several thousand runners on the Dolomites single tracks would have. At least I got to share some early continental trail time with Dave before a call of nature broke our soirée. Got to see the lighter side of it somehow! 3. As for the feed stations… tirade time! 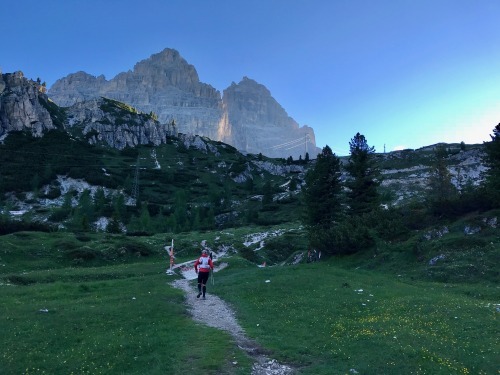 I arrived at Ospitale at 1:50am keen to top up my water, grab a quick snack and be on my way before the biting chill of a sub-zero night took hold. So I patiently queued. And waited… and waited… and waited. After a few minutes it dawned on me the only way to get served was shout rudely and thrust your bottle in front of those in front of you and wave it in some poor attendants face. Ok everyone is tired and keen to get on their way but how can anyone in the back third of the field justify an urgency to get served before those who have been queueing longer. 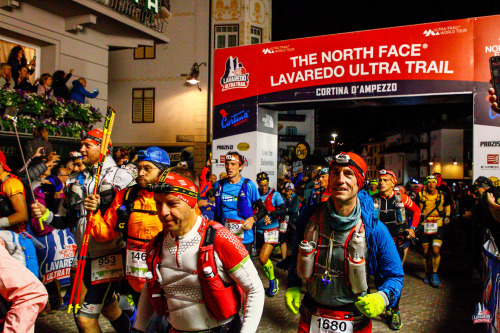 It was a farce; it was a fight; it was going to get a lot worse at the second aid station in Federavecchia. Here the focus was hot soup and the atmosphere ferocious. After much pushing and shoving I made it to the table and took it on myself to distribute bowls to those who had clearly been waiting longest. But getting your soup was one thing, making it back out of the melee without spilling any was a fresh challenge. 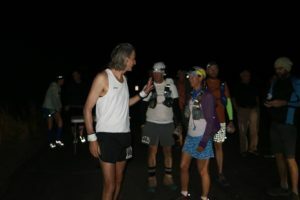 I left depressed, hungry, and hopeful that dawn might bring sense or at least spread the field enough to reduce the volume of runners passing through a station at any moment. Dawn in the Dolomites. Hellooooooo mountains! The night is short, two hours shorter than MIUT, and it was a blessing to see the dawn twilight not long after 4am. 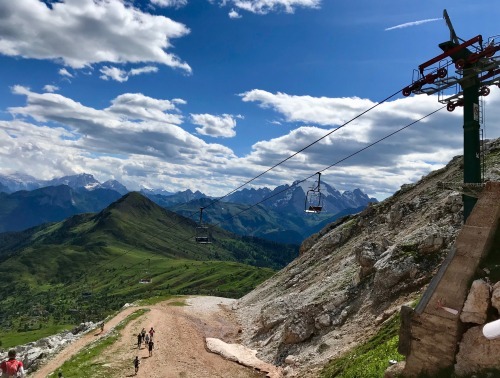 Another bloody forest track and to my delight I had caught up with Dave for a jolly good moaning session as can only be expected from a couple of miserable Brits in the beautiful Alps! To be honest Dave had considerably more cause than me - his toe was hanging out of a large tear in the front of his borrowed La Sportiva while his poles were reluctant to lock rendering them useless. 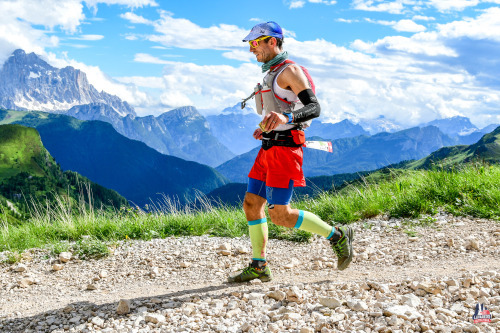 So here is the next lesson - the one every other ultra runner has ingrained in their psyche. 4. Prepare your kit well in advance. The weather forecasters had thrown every possible element our way in the build up to raceday. Thunderstorms, snow, hail… we might expect it all. 48 hours prior it became clear it was going to be dry and sub-zero on the high passes. So gloves became an essential piece of kit. Could Dave buy a pair of cheap gloves in Cortina? No chance! 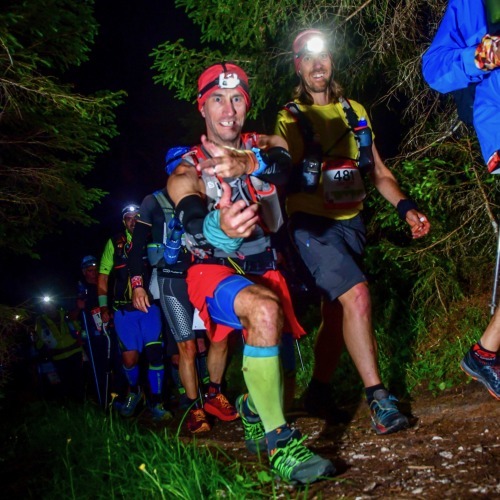 It came down to 35 euros in the North Face shop on a pair of Etip™ Gloves that unstitched hours into the race. They did have a button on the index finger though which had a strange effect on Tango Tom when pressed. The humour was lost on the North Face staff and, further to the injustice, they refused to refund Dave’s faulty gloves after the race. 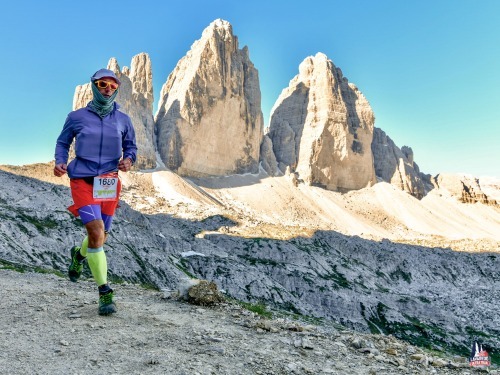 The official sponsor of Lavaredo showing disregard for a competitor. What a shame! So, if you don’t have the kit list or forget to pack an item make sure you have a credit card ready to burn. Another tip from the “man who runs in other people’s gear” is don’t leave your race shorts in the drop bag. 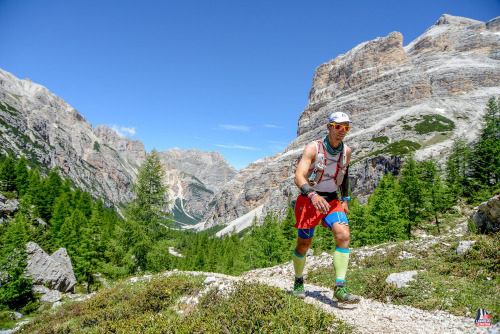 Thanks to that comic faux pas, Dave’s quick drying, anti chafe, breathable, lightweight shorts were in a van heading into the heart of the Dolomites. While Dave was left attired in a pair of cotton combat shorts, which, I should add, he chose not to trade in when he finally reacquainted himself with his drop bag. I have never known anyone so cool, calm and collected despite having the wrong gear. Well fortune favours the brave as a bird kindly pooped across Dave’s face on our way to the pasta party! This left Becky in stitches. A few days later Dave had been offered a lucrative new job in the bright lights of the big city and the black shoes and blazer I had been hauling around in our trunk were justified. Perhaps one old wive’s tale worth heeding? 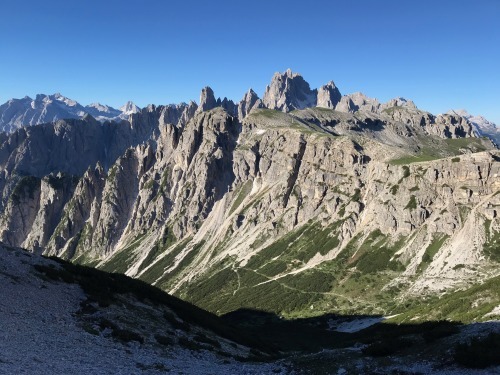 And here are a few more photos from the climb to Rifugio Auronzo in the shadow of Tre Cime’s southern faces. This is going to be subjective. 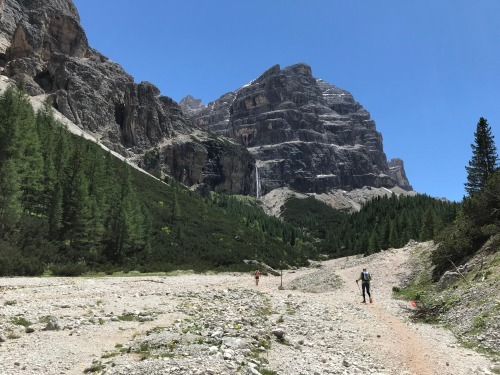 Coming off the back of the Camins de Cabres which entailed countless hands on scrambles, rope aided slabs, bouldering river beds and near vertical switchbacks, the Lavaredo trails felt somewhat tame. The backdrop was at times stunning but I found a lot of the paths repetitive and many of the forest tracks surprisingly similar to home. 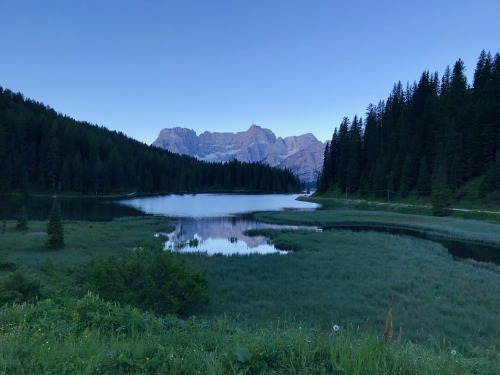 A runnable root-laden trail that snaked through the pine forests of Pian Maccetto could have just as easily been Denas Road. The long fire road that gradually climbed to Cimabanche resembled the track that bisects Idless Woods. Boulder hopping around Forcella Giau a mirror for Penwith’s crooked coastline. Tre Cime. Described as one of the most beautiful mountains in the world. I wasn’t quite prepared for how big these rocks are! 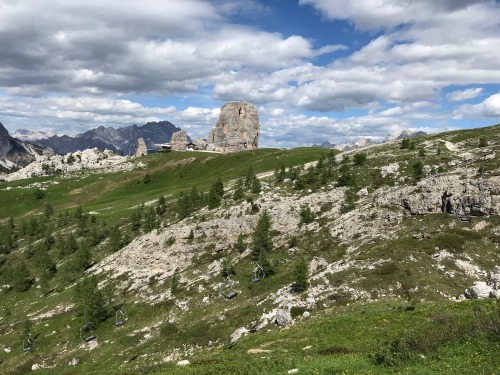 It was only in the higher passes when we climbed above the forests that the Dolomites finally stole the show. 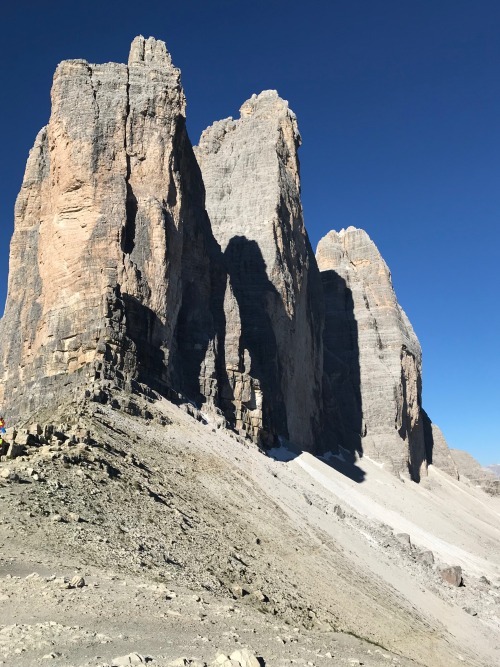 The triple pinnacles of Tre Cime, the vast walls of Val Travenanzes. The abandoned caves and ruined buildings of the Falzarego Military Hospital which offered glimpses of the traumatic struggles of the Great War. I am not denying there are some challenging, runnable, sections on this course. 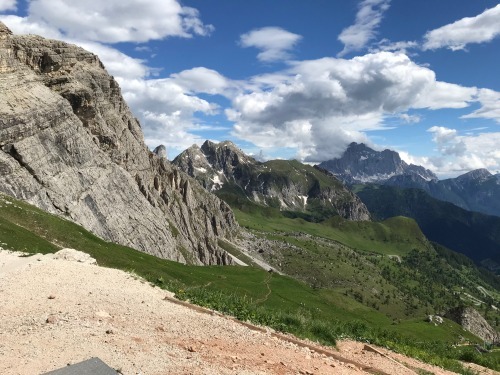 The long descent from Tre Cime is fast and exciting with tight switch backs, plenty of loose rock and occasional steep drops which are best avoided. This eventually runs out into Val Della Rienza before the long slow climb to Cimabanche on yet another fire road. It was about this point in the race I found myself trailing a British runner with Lipton on his race bib. The suggestion was something, the fact no such runner appeared in the results list meant the hallucinations were kicking in early. However, at Cimabanche my newly discovered treat for the rest of the race became iced tea (or cold tea at least). It might not have had quite the caffeine level I desired but it kept me going for the final marathon. Of course this was not before standing gooseberry once again. This time at the bag drop as the attendants were too busy having a conversation to assist me. Yet quick to help another runner who shouted at them in the local lingo. If only I knew a little Italian. 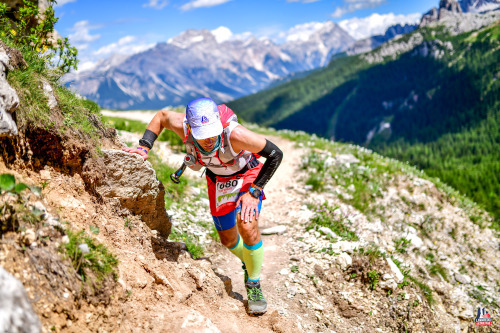 My biggest fear ahead of the race was the high altitude. My highest summits to date were Pico Arierio (5965 feet) in Madeira and Pico de las Nieves (6394 feet) in Gran Canaria. Making me a 2000 metre virgin. I had assimilated the online tips: arrive last minute to skip acclimatisation; avoid alcohol at all costs. I had failed on both counts. 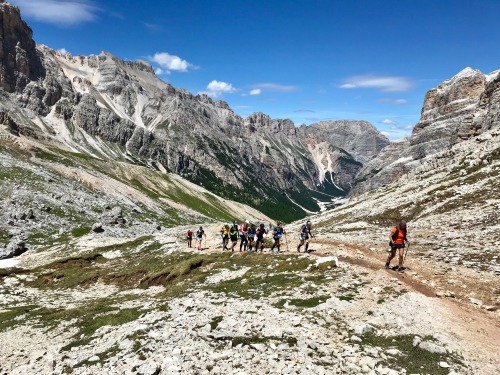 The race route barely crests 2500m and does spend a considerable portion of the last marathon above 2000m but I never felt incapacitated by lack of oxygen. Sure there is a good chance of feeling exhausted on the long arduous climb out of Death Valley ☠️ but quite frankly after the best part of 36 hours without sleep and 15 hours of hard running and hiking who wouldn’t want to sit at the side of the path and bury their head in their hands. Dig deep and get the job done! And maybe put some cheesy nostalgia on the iPod to drown out the omnipresent and metronomic reverb of poles. 7. Oh my god… Poles. Did I mention the chaos these created on the first climb of the night? Too many people, too many poles going wayward, how did no-one get seriously injured? I took one for the team on the first ascent as the runner in front waved his pole aimlessly across my face. I am massively in the minority here. At least restrict the use of poles until the runners have dispersed a little. I counted less than a dozen fellow runners without poles over the entire course and since most of these were in Death Valley ☠️ they may well have been part of the Cortina Trail Race. 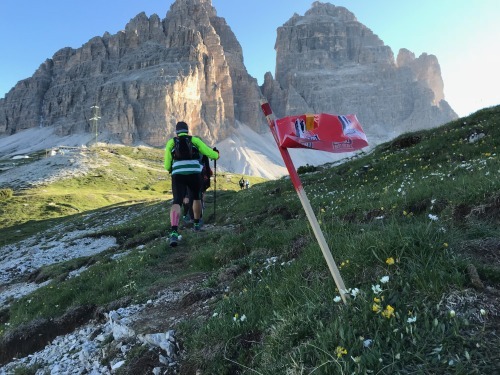 Could poles have helped me when pace fell below 2mph on the steepest climb of the course to Rifugio Averau at 2413m. Becky’s expression when she tried to initiate me to her Black Diamonds in the campsite suggested probably not! 8. Stay on your feet! Obvious really. But I am rarely one to shy away from a fast descent and the risks that come with that. 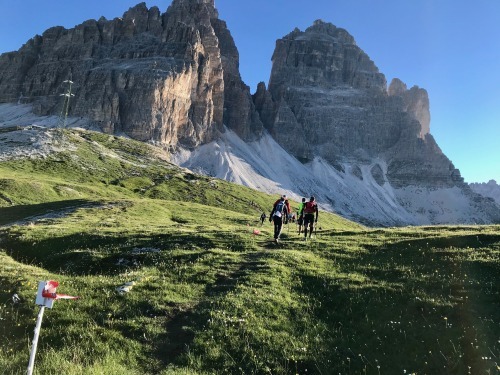 My knees had taken the brunt of my indiscretions in 2018 and Lavaredo was going to be no different. 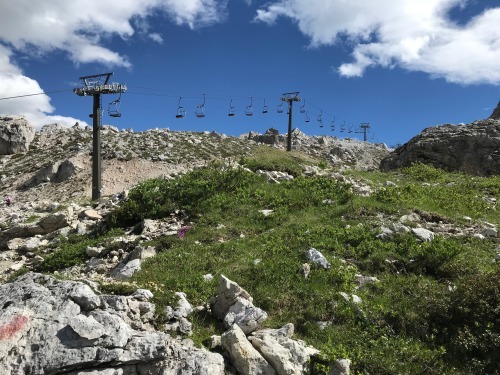 On a course that rarely deviated from an occasional root and boulder fast downhills should come easy and having been held back in the night I was keen to make the most of every metre on offer. 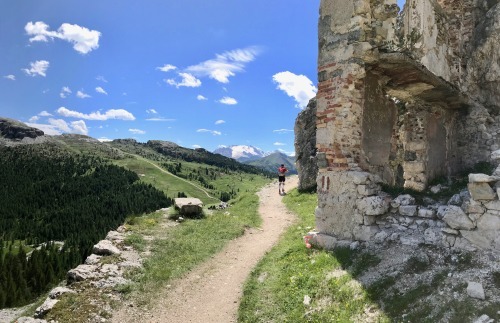 So, it really didn’t help that I ran into the fence entering Rifugio Col Gallina and once again smashed my kneecaps on the road. It really bloody hurt. Time briefly froze, while the hot tarmac felt comfortable. I lay with my eyes closed grimacing in pain. “That’s it, race over”, I told myself. 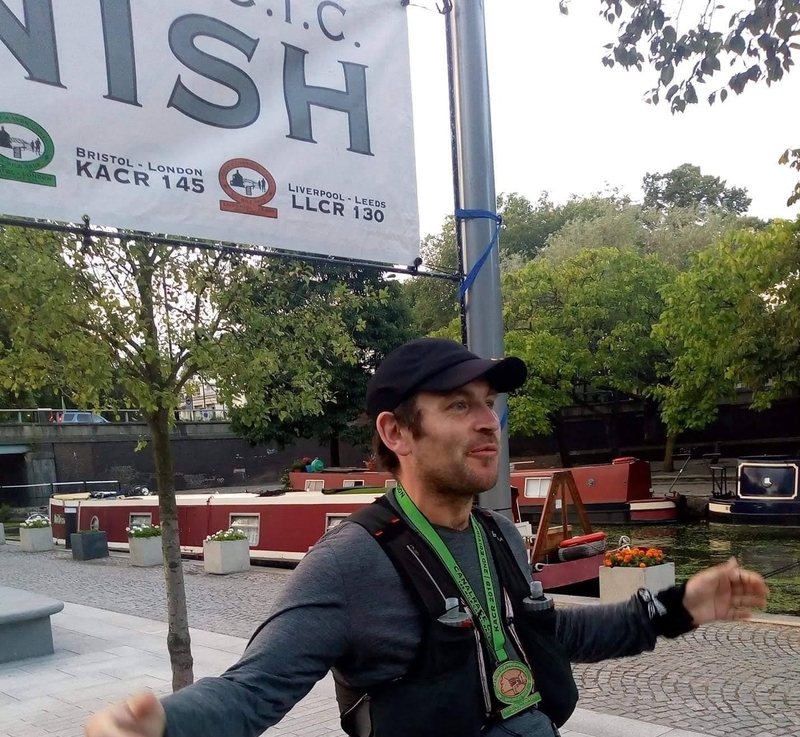 “Finally I can sleep.” Then the silence was broken by fellow runners and medics shouting over me. 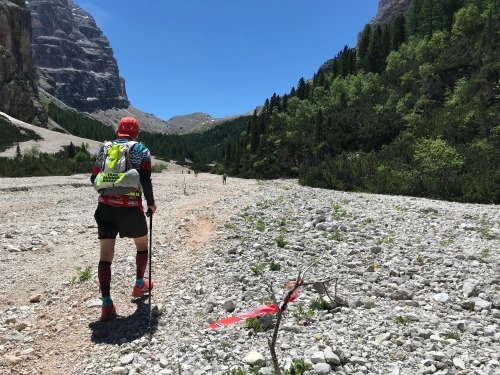 I brushed down the trickles of blood, pulled myself up and, unsure of what everyone was shouting at me, hobbled on to the feed station undeterred. Unfortunately this mishap would haunt the rest of the race and the rest of the vacation as the right knee swelled up, tendons inflamed and my gait became a hobble. 9. If you are gonna be picky about food you really have to fend for yourself! By the time I crested Averau, I was indifferent to the beef broth being the only sustenance on offer. Calorie intake would have to override dietary requirements this once. Besides I had no idea what was in the soup I had been consuming for much of the day. Based on the terse negative response of one aid worker to a lady who asked for something “vegetarian”, I suspect it was not to my liking. 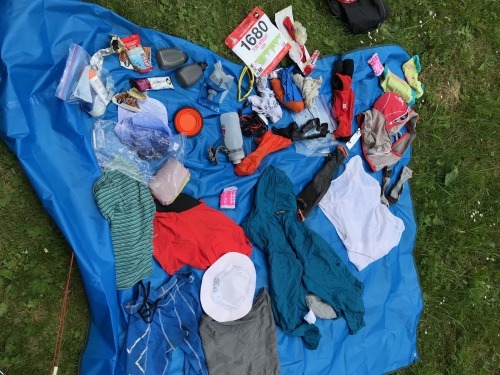 Again I chose to carry little with the intention of relying on a diverse selection of food stuffs at each aid station. Perhaps my brain was addled by the air or the exertion, but when I wanted savoury there was only sweet, when I needed sweet there was only savoury! I tried desperately hard to find a friend on that last undulating marathon. The legs were shuffling, time was going very slowly and I was feeling a tad catatonic. Everyone seemed paired off though and whenever I tried to strike up conversation I got little more than a nod or a concerned expression at my apparent impertinence for interrupting! At one point I recovered a pair of gloves from the track and put on a protracted and painful sprint to catch the runners in front to see if they had inadvertently dropped them. The reaction was one of rejection at best. Ouch! 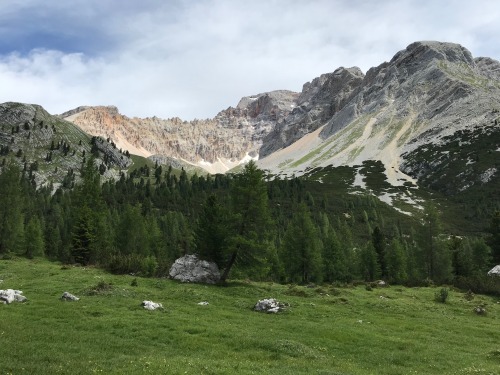 Some consolation came from the realisation that Rifugio Averau was not the mountain hut sat atop Nuvolau in full view for much of the last blistering climb over loose scree and rock but actually hidden in a col some 150m lower down the mountain. Downhill all the way now - well most of it! I contemplated my friends who I assumed were both still making their way up Death Valley ☠️. Unbeknownst to me Becky was minutes from the finish line and a well earned birra. 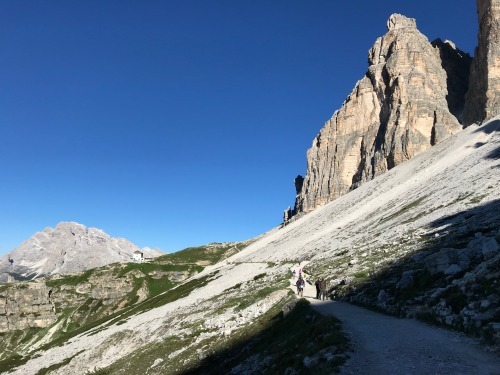 So, as the sun gradually sunk back into the mountains, some nineteen hours after setting off, lonely old Tom finally crested the col at Forcella Ambrizzola and, in the shadow of the high fortress of Croda da Lago, began the long descent back to Cortina. I was confused and a little bit excited by my overall time. My target had been 24 hours, and as the kilometres had ticked by I had reduced that to 22 hours. Now I was wondering if twenty was possible. 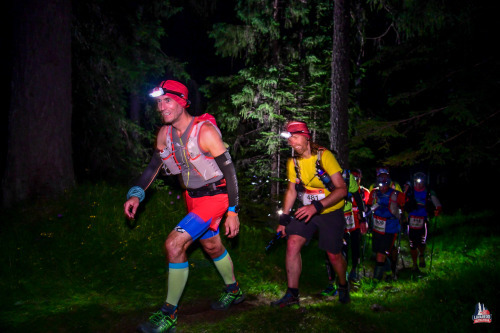 A glimmer of hope that had me hurtling unsteadily through the forests of fir that concealed the unexpectedly long distance still to cover to reach the finish. Unfortunately I had little energy to tackle the gradual climbs and flat roads that broke up the passage and the minutes ran away from me. Those queues that had plagued me throughout the previous night came back to taunt me one last time at Lago d’Ajal. My bottles were dry, I had no food and was desperate for some energy. 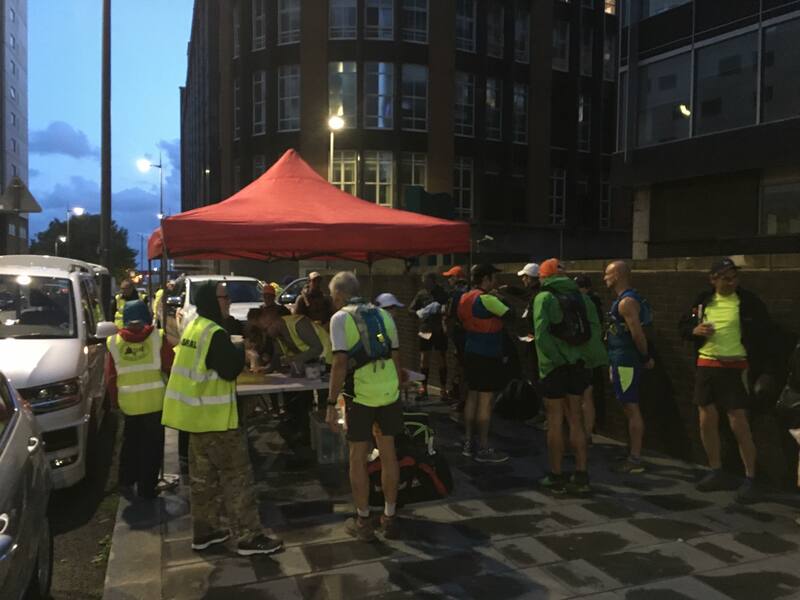 A crowd was gathered around the sole distributor of water at this final feed station and there was little chance of penetrating the wall of people - were they even runners - that guarded the table. So I reversed straight back out on to the course in the hope a little stored reserve would see me through. Frustrations aside, this was perfectly contrasted and complemented by one of my enduring memories of the race. 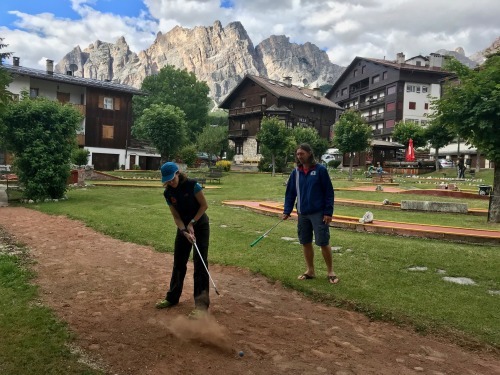 On the fringes of Cortina, a pop-up feed station where a couple of local villagers handed out Cola and what looked like something considerably stronger. For once there was no queue, no disregard. Just pleasure at helping us weary travellers in the final throes. Not that it was really needed with one mile to go, I couldn’t turn down such a kind gesture and stopped for a glug of glucose. The road through town to the finish did little to lift my mood. Tourists going about their day to day routine or hanging out of the bars that littered the street. The runner in front appeared to be holding back, perhaps timing the perfect finisher’s photo. Well that was one last orc for me as I raced past and under the arc. Stopping briefly to do some embarrassing semblance of the Orange Justice. Some English bloke mumbled something at me on the mic and then brushed me aside as quickly as my race had come to an end. And that just about sums up LUT! LUT is a ballot. There is a 66% chance of actually getting into the race. 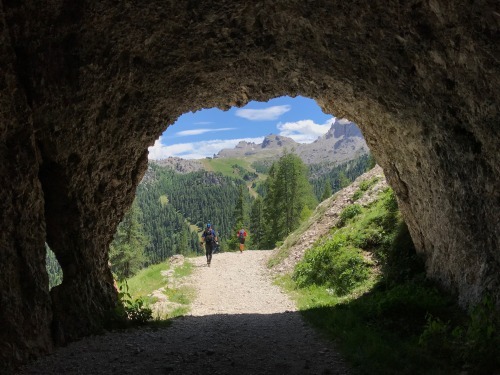 I should feel lucky to spend quality time on the beautiful Dolomite trails. But when events grow this big the challenges of management also escalate. The hundreds, or was it thousands, of volunteers out on the course, whether marshalling or trying to hold their own at feed stations were, in most instances, fantastic and I hope they have all been duly rewarded for their time, dedication and effort. Clearly there is a major issue with management of the feed stations where a simple FIFO queuing system would be beneficial. At least Rifugio Auronzo had a queue forming. Unfortunately, they briefly ran out of hot soup at the moment I joined that queue. At the finish. Relieved and just a little bit tired! 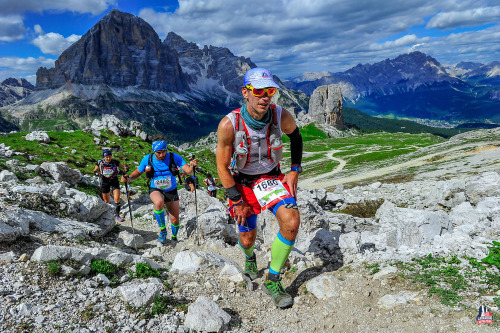 I wouldn’t want my own experiences to put anyone off entering Lavaredo Ultra Trail. At least if you are better prepared and know what to expect you can probably enjoy it a lot more than I did. My previous outing on the UTWT was Madeira and personally that was on a totally different scale of enjoyment and wonder. There isn’t a single person on that small island that doesn’t want to help and see you reach the finish. The landscape, in my opinion, surpasses the Dolomites. Plus there are crashing waves which, as a wannabe Cornishman, makes me feel at home. And I got to spend the best part of a day with big Bri! But, this wasn’t just about me. It was a weekend away with friends and we tucked into the german beer in earnest the following day accompanied by World Cup fever. In 2015 I had run with Becky for the first time as I led her and Dave on a wild, thorny, excursion of the Badlands in deepest Penwith. 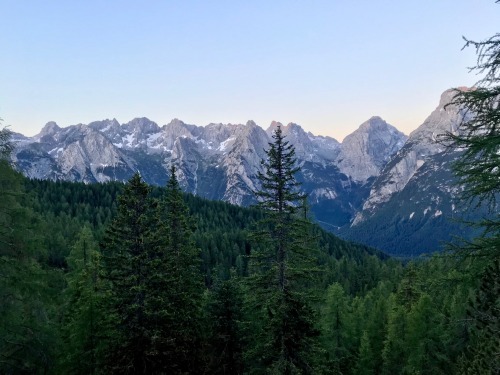 Gorse is still a topic of much amusement now but I would never have predicted then that, three years later, we would be supping steins and sharing stories in a bar in Cortina d’Ampezzo. In fact I am amazed either of them ran with me again! Becky was celebrating her fortieth birthday with her dream race and what a performance she delivered. Finishing in 19:48, 28th female overall, competing with the elites and setting a Cornish record. Hats off! 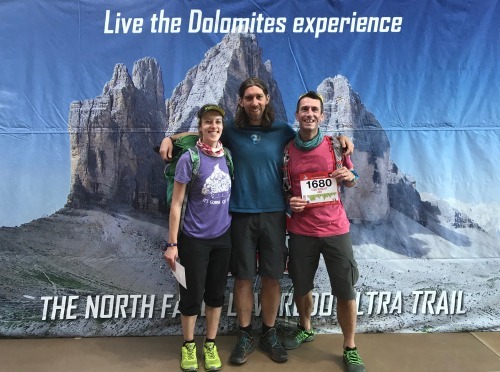 Dave proved his resolve simply by finishing in 21:55 and confirmed those dilapidated La Sportiva had at least another 100 miles in them. I bettered my own expectations crossing the line in 20:36. Of course the real competition was decided on the crazy golf course on Monday once the hangover had been cleared by a cable car ride to Tofana’s summit. This just left a day touring the delightful sights of Venice before heading home to Cornwall. 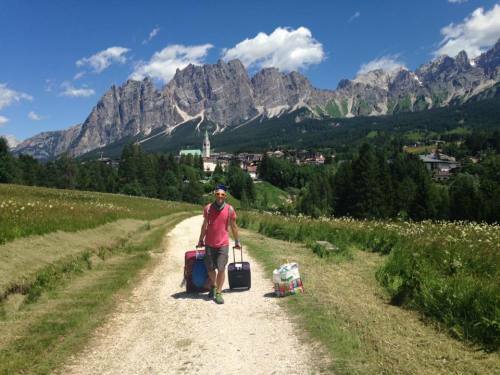 On top of the world… well the Dolomites at least. Only a few footsteps from the summit of Tofana di Mezzo at 3244m. Bridge of Sighs in Venice. You wouldn’t know behind the camera there were several thousand other tourists!